Elizabeth and Tim's day complemented their personalities perfectly: fun-filled, light hearted and sweet down to the very last detail. Their color palette of blues, pinks and pops of yellow paired with the beautiful décor of Keene Place flawlessly. 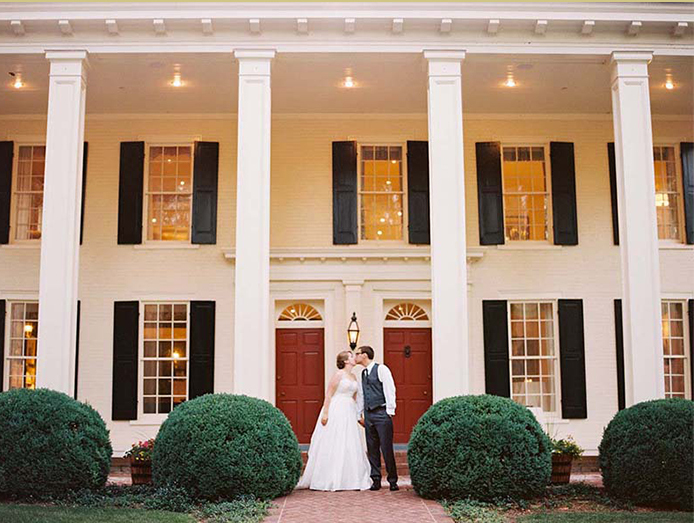 From the very first moment Elizabeth and her mother walked through the historic Keene Place, it was clear that it would be the perfect fit for them. The menu for their big day fit their style and personalities. The couple wanted a casual cocktail party which was perfectly matched with food stations of Mac and Cheese, Fish Tacos, Smokehouse BBQ and Satay freshly prepared by chefs in front of guests, while Corn Cake and Pimento Cheese Sliders, Miniature Crab Cakes and Southern Fried Chicken Martinis were passed to guests on the patio. It was a meal that was enjoyed by all and allowed guests to mingle throughout the entire evening. Guests also enjoyed refreshing sangria during the summer wedding. Their wedding cake was not only adorable but also delicious, and was accompanied by minature pies. The couple included so many family touches throughout the day – wooden vases as centerpieces to intricate paper dolls made by family, and family pictures scattered throughout the mantles of the historic home. Guests enjoyed a multitude of games on the back patio, including a giant love ball, giant jenga, corn hole and croquet. What are some of your favorite memories? I remember how overwhelming and special it was to be surrounded by so many people who love and support us on our wedding day. Many of my college friends had never been to Kentucky and it was wonderful to see them fall in love with the Bluegrass during our wedding weekend at Keeneland. What made your day so special? My day could not have gone so smoothly, been so beautiful or so fun without the help of Morgan (Keeneland Coordinator). Not only did she coordinate the timeline of events perfectly, but I heard later that she went and found my grandmother to make sure she had a front row view of all those special moments. Tim and I could not be more grateful to Keeneland for the beauitful event space and to Morgan for her attention to detail.